Walking Through Time was featured as a full page news story in the Scottish national newspaper The Sunday Herald. On page 5 too! it seems to have captured the publics imagination. “Time travelling used to be an expensive, clumsy business. According to TV shows and films such as Dr Who and Back To The Future, would-be explorers of the fourth dimension need at least 1.21 gigawatts or a large blue police box to get anywhere. 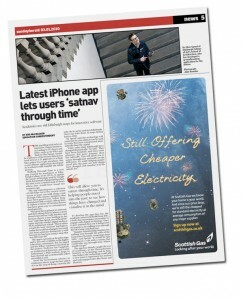 But a new iPhone application developed in Scotland could simplify the whole process. This entry was posted in GPS navigation, Location Services, Locative Media, Work on Project and tagged endUser, jiscri, news, projectEvaluation, WalkThruT, WTT. Bookmark the permalink.